Widespread looting and violence against stranded hotel guests reportedly swept an island left crippled by Hurricane Irma. Looters started raiding hotels and shops in St Maarten after the Category 5 storm battered the island on Wednesday. Those remaining in the Dutch territory said the situation was like a ‘civil war’ as looters armed with guns and knives descended on vulnerable locations. Dutch soldiers were deployed on Friday to help authorities on the island, who were struggling as communications were hit badly by the storm. Yesterday, Prime Minister William Marlin said the island remains under curfew and that the looting has ‘subsided’. Marlin said about 1,600 tourists who were on the island have been evacuated and efforts are being made to move 1,200 more. On Friday, Massimiliano Napoliello, the manager of a bar in Maho Beach, made a desperate appeal to help families, children and babies get off the island. 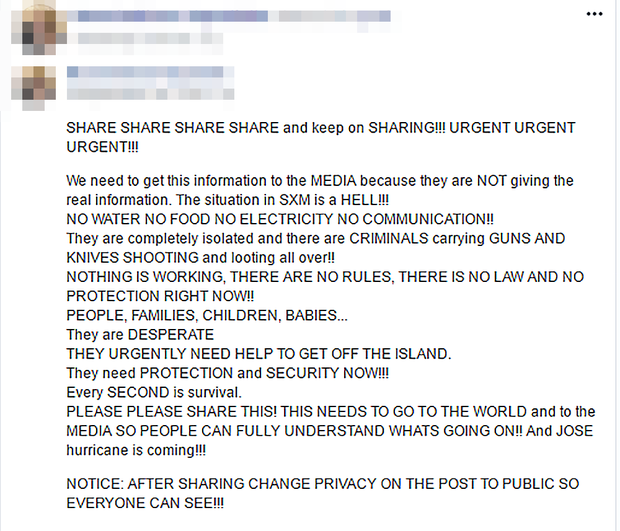 He wrote on Facebook: ‘The situation in SXM is a HELL! NO WATER NO FOOD NO ELECTRICITY NO COMMUNICATION! ‘They are completely isolated and there are CRIMINALS carrying GUNS AND KNIVES SHOOTING and looting all over! Local media reported how a group of men overpowered security and staff at Simpson Bay Resort before heading to rooms to take jewellery and money. ‘They even punched and kicked another tourist for trying to stop them from looting. Thank god for marines and police who came and got the situation under control,’ a tourist told The Daily Herald. Military personnel arrested five men and the area was cleared by police and coastguard officials. Many islanders took to social media to urge people to stay inside. This local made her plea on Facebook: ‘People stay at your homes we are under 24 hr curfew . Among the opportunists taking advantage of the worrying situation, are reports of kind locals doing their best to help out. Workers at Ranchos bar in Simpson Bay, near to the hotel looters targeted, had a cookout on Friday and gave food to people in need. Robin Pieters shared a video of the Good Samaritans on Facebook saying their actions were ‘beyond compassion’. Local media reported that instead of the meat going bad, the bar wanted to help feed hungry islanders and encouraged other businesses to do the same. The Prime Minister said many nations and people have offered help to St Maarten, but weather conditions will determine how this can be coordinated. Authorities are still trying to determine the extent of damage to the island, but he said 28 police officers lost homes during Hurricanes Irma and Jose. UTTER DISGRACE IN SXM…..WRONG PEOPLE IN GOVT…..TIME TO RETURN SXM BACK TO THOSE WHO CHERISHED USA AND AMERICANS…..THE PRESENT GOVT An OUTRAGEOUS DISGRACE AND COMPLETE FAILURE….SXM BACK TO DIRT RUNWAYS….